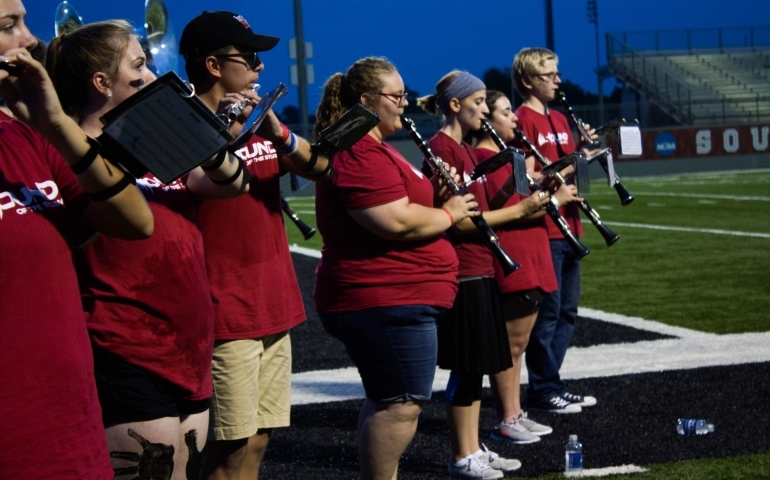 Long hours, blazing hot practices, and countless steps taken all over the football field– many people may not realize it, but this is the reality for students in the SNU’s Crimson Storm marching band. As one of the first groups back on campus after the summer break, our marching band has been working hard to provide memorable entertainment for this coming year. This fall marks SNU’s third year to have a marching band. Daniel Abrego, the director of the marching band, takes all summer to prepare the theme for the show, rehearsal drills for students, and music that pulls the audience in. Not only is there music to arrange and choose for the halftime show, but also music that is played in the stands during the football games. While performing well at all these events and bringing good publicity to SNU are both important successes, Daniel Abrego and Percussion Captain, Christian Morse, were both adamant about focusing on a different type of success. Similarly, Professor Abrego mentioned that “one of the most rewarding parts of the band for me is hearing the end of the season stories from the students. How they came from a place where they were more of a number and to hear them say that [SNU] is different from other places is really rewarding. We really try to build a community”. If you’re interested in checking out SNU’s amazing marching band then you’re in luck– see them perform in the stands and on the field at every home football game, and give a loud cheer for the SNU’s Crimson Storm marching band!